The Cadillac Three is joined by Thomas Rhett, Eli Young Band’s Mike Eli, and Florida Georgia Line’s Brian Kelley. Ready or not, CRS is off to another bold start this year. Last night (Feb. 18) Big Machine Label Group and CMT Radio proved after parties are no exception. The two powerhouse brands joined forces for night one, of two, at Nashville’s Marathon Music Works. A full open bar and spread of finger food and dessert was adorned by steel link chain decorations, while plexiglass illuminated artist-themed tables dotted the schmoozing floor. Pictured (L-R): Republic Nashville President/BMLG EVP Jimmy Harnen, Brian Kelley, BMLG President/CEO Scott Borchetta. Founder/Pres./CEO of BMLG, Scott Borchetta welcomed the crowd with CMT After Midnite With Cody Alan’s, Cody Alan. During the event, Alan took the stage with CMT SVP of Music Strategy, Leslie Fram, to whet the radio crowd’s appetite for a weekend show planned by the radio giant. The BMLG lineup included Rascal Flatts, Eli Young Band, Cadillac Three, and Tim McGraw. The absence of Florida Georgia Line’s Tyler Hubbard, due to a motocross injury, kept the duo from performing its previously scheduled slot. 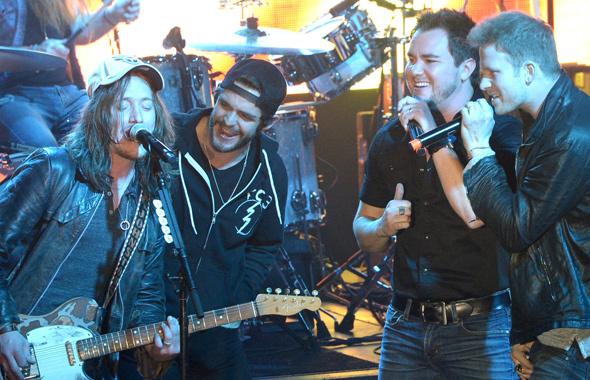 FGL’s Brian Kelley joined his labelmates onstage though. The VIP crowd was treated to new music from nearly every act. 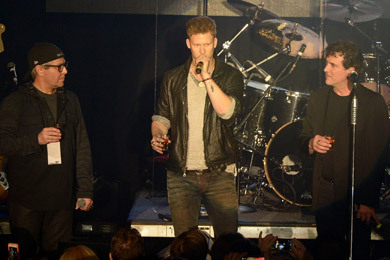 Rascal Flatts tempted attendees with music, due May 13, including “Payback,” “Memphis,” “Night of our Lives” and current single “Rewind.” The Cadillac Three welcomed Kelley, Mike Eli and Thomas Rhett to the stage for the MusicRow CountryBreakout Chart’s No. 61-and-rising title, “The South.” Eli Young Band took to the room’s other stage, offering staples from its catalog as well as latest single “Dust” from album 10,000 Towns, due on March 4. 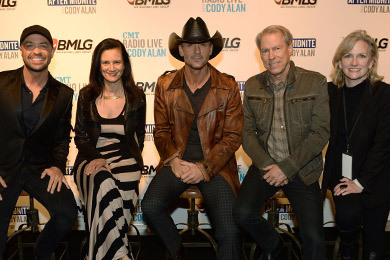 Pictured (L-R): CMT After Midnite’s Cody Alan, CMT’s Leslie Fram, Tim McGraw, and CMT’s John Hamlin and Anne Oakley. McGraw wrapped the evening, taking the stage with a music stand to hold new song lyrics. Around May 2014, a new album is expected to contain songs he previewed: “Overrated,” “Singin’ to the Radio (Shotgun Rider),” and “Keep on Truckin’.” Standout titles also included “City Lights,” about gazing at the diamond dusted lights of town in summertime with a slowly burning cigarette; and “Words of Medicine,” with lyrics speaking of the healing power of compassion and empathy.